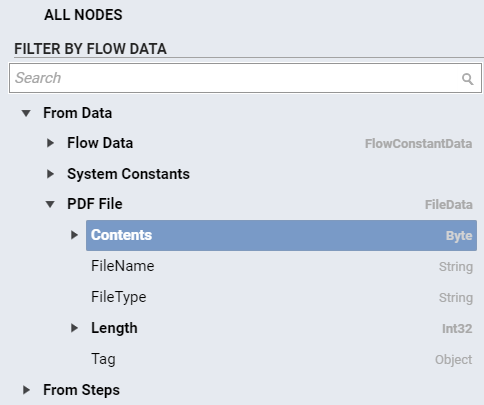 The Set PDF Form Fields	component in a flow can populate a PDF form template with data. When used in a flow, this step reads a PDF form template to identify its fields, then provides input fields for populating the form data. This step does not actually create the file; it works in conjunction with the Create File	step. 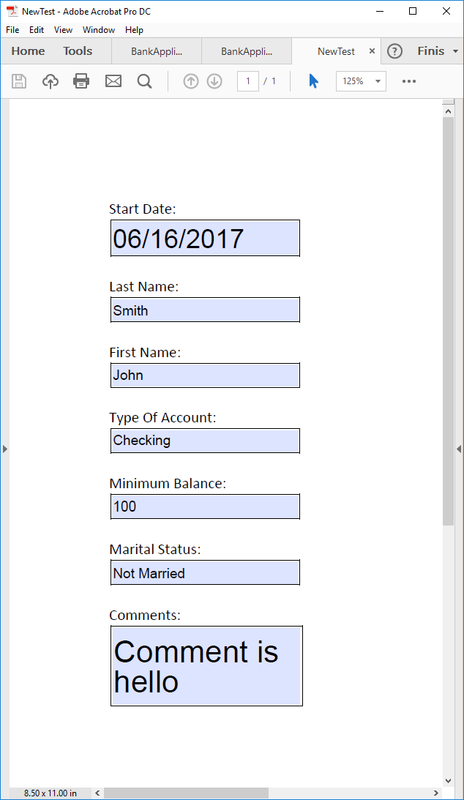 This example populates a very simple bank account application. From a Designer Folder, create a new flow. From the Toolbox	, expand Data > PDF	and drag and drop a Set PDF Form Fields	component into the workspace. Connect the Start	step to this step. Click on the Set PDF Form Fields	step, and then select the Properties	tab. The PDF File Example	field can contain either the original PDF form template to populate, or an example of a populated PDF file of the same template type. Click the Browse	button and select the appropriate file. Notice the field names are identified. Next, configure the inputs for the Set PDF Form Fields	step. This example uses constant data, however variables or merged text, for example, could be used. The Input fields will respect the data type of the PDF form field when mapping in the input data. For example, if a form field in the PDF is numeric, establish compatible input for the field within the Set PDF Form Fields	step. 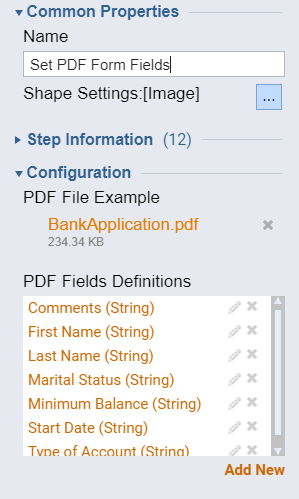 The Outputs	section shows the name of the Set PDF Form Fields	step output, which is of type FileData. This example retains the default value for the file data. This completes the configuration of the Set PDF Form Fields	step. Next, add a Create File	component following the Set PDF Form Fields	step. From the Toolbox, expand Integration > File	and drag and drop a Create File	component into the workspace. Connect the Set PDF Form Fields	step to this step. Connect the Create File	step to the End	step. Click on the Create File	step. From the Properties	panel, under Inputs > Data	, set the mapping type to Select Value	. Click on the Path:	field Browse	button and select the file content output from the Set PDF Form Fields	step,PDF File.Contents	. 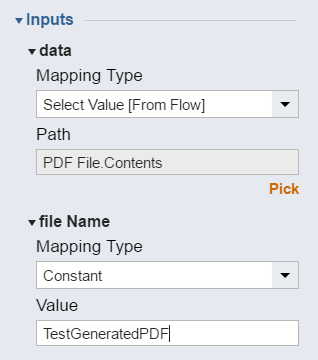 Set the FileName	mapping type to Constant	, and type a name for the file in the Value	field. This completes the configuration of the Create File step, and completes the flow. Click the Debug Flow	link above the workspace. Run the flow in the Debugger. The file generates to C:\Program Files\Decisions\Decisions Services Manager by default. Open the file using a PDF reader. Notice the form fields are populated.